It’s little surprise Moriah Hajduk became a field hockey player. She grew up watching her older sisters, Michaela and Katriona play the sport and was indoctrinated at an early age. All three sisters played for successful teams at Winthrop High School, but it was baby sister Moriah who came away with the biggest prize, a Class C state championship. “It’s such a great way to end my high school career,” Moriah said. The Ramblers finished at 17-1 this season, knocking off Spruce Mountain in the state final. For her efforts this season, Hajduk has been selected Kennebec Journal Field Hockey Player of the Year. Hajduk has been a four-year starter, primarily at midfield and was a rock for the team and coach Jess Merrill. Merrill was well aware of the Hajduk family pedigree and expected no less from Moriah. Hajduk has worked hard in the off-season to improve her skill, playing just last week in a tournament in Florida. 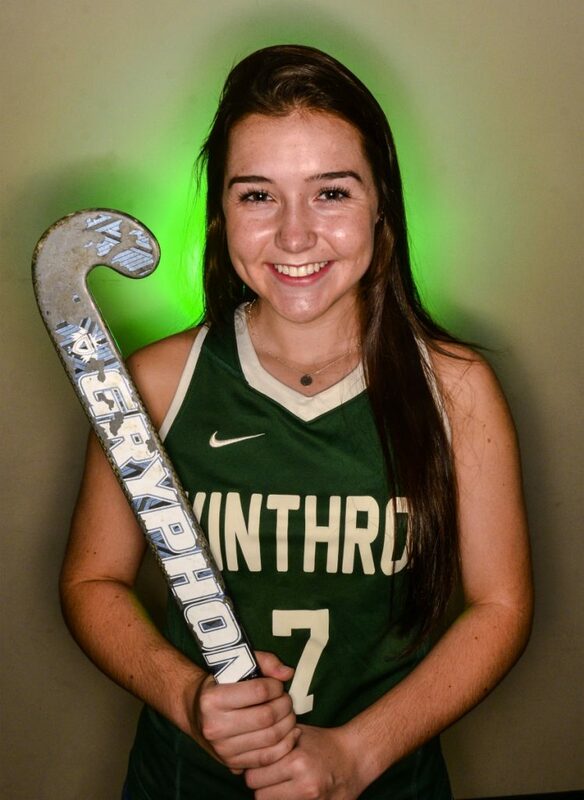 Her stick skills and confidence have improved steadily throughout her high school career and she’d like to take the next step. Her sisters both played for Div. II St. Michael’s College in Vermont, Michaela a recently graduated captain and Kat a sophomore on the team this year. Moriah’s not sure she wants to follow their footsteps. Merrill’s sure Moriah will be successful at whatever level she ends up playing. Hajduk assumed more of an offensive role at midfield the past two seasons and this year finished with 12 goals and 15 assists and was named Mountain Valley Conference Player of the Year. When the Ramblers had the lead, which they did in nearly every game, Merrill often slid Hajduk back to defense to preserve a lead. This year she recorded three defensive saves. “She can play anywhere on the field and be successful,” Merrill said. Like her sisters, Moriah is built fairly low to the ground which helps her strong drives and her goal of always keeping her stick on the ball. She’s a successful player and starter on the school softball team which reached the regional final and enjoys the camaraderie of team play, especially when it culminates with the grand prize. “We were all just so happy to get that state title,” she said.